La trombosis venosa es una condición clínica en la cual un trombo se genera y ocluye la luz de un vaso venoso con el consecuente riesgo de embolia pulmonar. La fisiopatología se relaciona con estados de hipercoagulabilidad, alteraciones del flujo sanguíneo y lesiones vasculares endoteliales, conocida como la triada de Virchow. 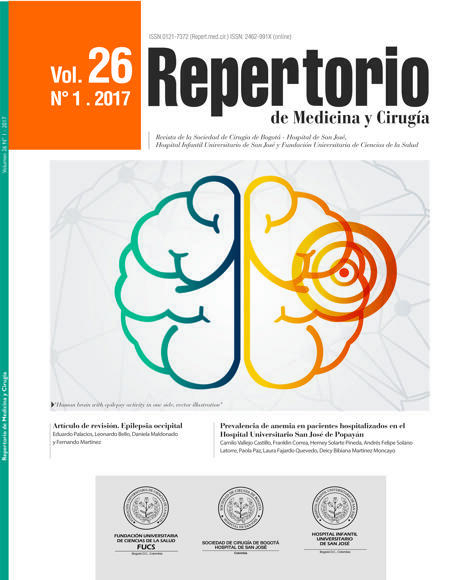 Dentro de los factores de riesgo se encuentran el cáncer, la estancia hospitalaria prolongada, la cirugía mayor, el trauma mayor y las trombofilias; sin embargo en el 25-50% de los casos es imposible identificar el factor etiológico. Presentamos el caso de un hombre con clínica y diagnóstico de trombosis venosa profunda en manejo extrainstitucional con cumínicos, que acude al Hospital Infantil Universitario de San José por incremento de los signos inflamatorios en el miembro inferior derecho. Al ingreso hay aumento de la extensión de la trombosis venosa y niveles subterapéuticos de INR, a pesar de dosis óptimas de cumínicos. La evolución trascurrió con taquicardia y episodios de diaforesis. Se documenta y realiza el diagnóstico de hipertiroidismo asociado con elevación del factor viii de coagulación. 1. Vaya A, Mira Y, Martinez M, Villa P, Ferrando F, Estelles A, et al. Biological risk factors for deep vein thrombosis. Clin Hemorheol Microcirc. 2002;26:41–53. 2. Alotaibi GS, Wu C, Senthilselvan A, McMurtry MS. Secular trends in incidence and mortality of acute venous thromboembolism: The AB-VTE Population-Based Study. Am J Med. 2016. 3. Heit JA. The epidemiology of venous thromboembolism in the community. Arterioscler Thromb Vasc Biol. 2008;28:370–2. 4. Vázquez FJ, Posadas-Martínez ML, Vicens J, de Quirós FGB, Giunta DH. Incidence rate of symptomatic venous thromboembolic disease in patients from a medical care program in Buenos Aires, Argentina: A prospective cohort. Thromb J. 2013;11:1. 5. Hirsh J, Hoak J. Management of deep vein thrombosis and pulmonary embolism a statement for healthcare professionals from the Council on Thrombosis (in Consultation with the Council on Cardiovascular Radiology), American Heart Association. Circulation. 1996;93: 2212–45. 6. White RH. The epidemiology of venous thromboembolism. Circulation. 2003;107 23 Suppl 1:I4–8. 7. Squizzato A, Romualdi E, Büller HR, Gerdes VEA. Thyroid dysfunction and effects on coagulation and fibrinolysis: A systematic review. J Clin Endocrinol Metab. 2007;92: 2415–20. 8. Erem C, Ersoz H, Karti SS, Ukinc K, Hacihasanoglu A, Değer O, et al. Blood coagulation and fibrinolysis in patients with hyperthyroidism. J Endocrinol Invest. 2002;25:345–50. 9. Rogers JS, Shane SR, Jencks FS. Factor VIII activity and thyroid function. Ann Intern Med. 1982;97:713–6. 10. Burggraaf J, Lalezari S, Emeis JJ, Vischer UM, de Meyer P, Pijl H, et al. Endothelial function in patients with hyperthyroidism before and after treatment with propranolol and thiamazol. Thyroid. 2001;11:153–60. 11. Homoncik M, Gessl A, Ferlitsch A, Jilma B, Vierhapper H. Altered platelet plug formation in hyperthyroidism and hypothyroidism. J Clin Endocrinol Metab. 2007;92:3006–12. 12. Van Zaane B, Squizzato A, Huijgen R, van Zanten AP, Fliers E, Cannegieter SC, et al. Increasing levels of free thyroxine as a risk factor for a first venous thrombosis: A case-control study. Blood. 2010;115:4344–9. 13. Hofbauer LC, Heufelder AE. Coagulation disorders in thyroid diseases. Eur J Endocrinol. 1997;136:1–7. 14. Lin HC, Yang LY, Kang JH. Increased risk of pulmonary embolism among patients with hyperthyroidism: A 5-year follow-up study. J Thromb Haemost. 2010;8:2176–81. 16. Maes J, Michotte A, Velkeniers B, Stadnik T, Jochmans K. Hyperthyroidism with increased factor VIII procoagulant protein as a predisposing factor for cerebral venous thrombosis. J Neurol Neurosurg Psychiatry. 2002;73:458. 17. Franchini M, Lippi G, Targher G. Hyperthyroidism, venous thrombosis: a casual or causal association? A systematic literature review. Clin Appl Thromb Hemost. 2011;17: 387–92. 18. Debeij J, Dekkers OM, Asvold BO, Christiansen SC, Naess IA, Hammerstrom J, et al. Increased levels of free thyroxine and risk of venous thrombosis in a large population-based prospective study. J Thromb Haemost. 2012;10:1539–46. 19. Debeij J, Cannegieter SC, van Zaane B, Smit JWA, Corssmit EPM, Rosendaal FR, et al. The effect of changes in thyroxine and thyroid-stimulating hormone levels on the coagulation system. J Thromb Haemost. 2010;8:2823–6. 20. Stuijver DJF, van Zaane B, Romualdi E, Brandjes DPM, Gerdes VEA, Squizzato A. The effect of hyperthyroidism on procoagulant, anticoagulant and fibrinolytic factors. Thromb Haemost. 2012;108:1077–88. 21. Lippi G, Franchini M, Targher G, Montagnana M, Salvagno GL, Guidi GC, et al. Hyperthyroidism is associated with shortened APTT and increased fibrinogen values in a general population of unselected outpatients. J Thromb Thrombolysis. 2009;28:362–5. 22. Van Zaane B, Squizzato A, Debeij J, Dekkers OM, Meijers JCM, van Zanten AP, et al. Alterations in coagulation and fibrinolysis after levothyroxine exposure in healthy volunteers: A controlled randomized crossover study. J Thromb Haemost. 2011;9:1816–24. 23. Kearon C, Kahn SR, Agnelli G, Goldhaber S, Raskob GE, Comerota AJ. Antithrombotic therapy for venous thromboembolic disease: American College of Chest Physicians evidence-based clinical practice guidelines. Chest. 2008;133 6 Suppl:454S–545S. 24. Kearon C, Akl EA, Comerota AJ, Prandoni P, Bounameaux H, Goldhaber SZ, et al. Antithrombotic therapy for VTE disease: Antithrombotic therapy and prevention of thrombosis: American College of Chest Physicians evidence-based clinical practice guidelines. Chest. 2012;141 2 Suppl:e419S–24S. 25. Hirsh J, Fuster V, Ansell J, Halperin JL. American Heart Association/American College of Cardiology Foundation guide to warfarin therapy1. J Am Coll Cardiol. 2003;41:1633–52. 26. Akin F, Yaylali GF, Bastemir M, Yapar B. Effect of methimazole on warfarin anticoagulation in a case of Graves’ disease. Blood Coagul Fibrinolysis. 2008;19: 89–91.